Architectural Lighting Our lighting partners, that we call up for the top shelf stuff, have just finished turning one of our customers industrial buildings into a work of art…. Nice work Michael Lamusse from ACLX lighting. Click through to take a look…. 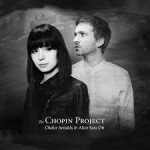 An album by Olafur Arnalds & Alice Sara Ott.